One thing is for sure, there is a lot of grass in New Zealand; probably more than we need, and many areas, especially on slopes, would be better planted out in native grass species or other suitable plants. But, if we are going to mow, at least let’s do it in smarter ways without the use of fossil fuels. We estimate that at least 40% of all mowing done by councils, large institutions and contractors could be managed by Mean Green electric machines. In terms of annual carbon emissions, replacing one ride-on diesel mower is equivalent to taking ten cars off the road. But, this hides the fact that the real situation is much worse: many of the components in diesel exhaust, such as volatile organic compounds, fine particle matter, etc, are not included in carbon calculations. Taking these other pollutants into account can change the numbers dramatically – namely, around 200 cars worth of emissions from just one mower. If we concentrate on carbon emissions, however, we tend to miss the significant health and safety issues created by operating fossil fuel mowers – please refer to the Health and Safety section for more information. Mean Green Electric Mowers are constructed of aluminium and steel, making them suitable for commercial applications, but this does mean that there is some embedded carbon included in their manufacture. Of course, this is the same as for other conventional mowers, and the only way to lessen this impact is to reduce mowing overall, as pointed out above. Many studies have been done on the environmental impact of lithium ion batteries, and we encourage those interested to search the many resources available on the internet. 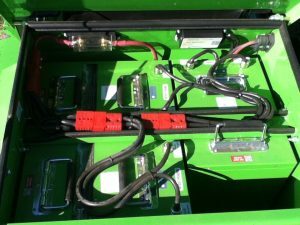 What we can say, however, is that the lithium energy modules (LEMs) used to power Mean Green Mowers last for a very long time at full capacity – around 8,000 hours for the industrial CXR-60 model. Most contractors will mow for around 1,000 hours per year. The batteries then gradually decrease in holding capacity, which doesn’t mean they need to be thrown away, rather, it’s possible to use them for applications such as solar power storage. At the end of their useful life we can recommend recycling options. New Zealand produces a very high percentage of electrical power from renewable sources (75%), so it makes a lot of sense to use that electricity to recharge vehicles and mowers alike. This percentage is likely to rise in the future and a national grid powered by 100% renewables is not out of the realms of possibility. As representatives of Mean Green Mowers in New Zealand, we at Carbon South take our responsibilities in terms of sustainability seriously. We offset the carbon miles of transporting the machines from head office in the US to New Zealand. We also offset all our unavoidable emissions incurred in the running of our business. This can include emissions for air travel, electricity and motor vehicle use. 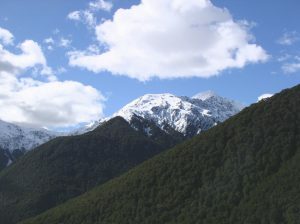 We select carbon credits from worthwhile foresty projects in New Zealand. 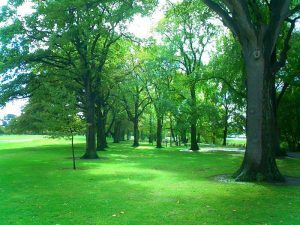 Our aim is to increase the sustainability of open space management in New Zealand so that we can all breathe cleaner air.